Last week was a bad week around my house...we lost our sweet cat Nimitz, who we had for 16 yrs, work was insane and Mother Nature was driving me crazy so I didn't do much stamping, I just wasn't in the creative mood. I did want to play along with last weeks Merry Monday challenge and started it on Saturday but didn't get it done in time to link up so that's the first card I'm posting. I haven't missed a Merry Monday challenge yet this yr and didn't want to start! It was a color challenge and we were to use the colors Pumpkin Pie, Marina Mist and Basic Gray. The Pumpkin Pie is layered under the main image panel, plus was also used for the snowman's nose. Basic Gray was used on the snowman's hat and for the panel under the Pumpkin Pie layer. 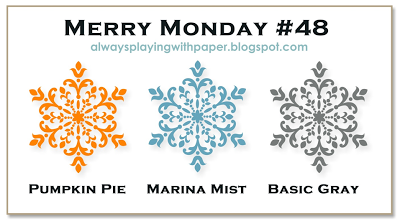 Marina Mist is obviously the main card stock and I paper pieced Marina Mist DSP for the letters in the image. The main image panel is popped up with dimensionals. Snowflakes from Wonderful Winterland were used on the background and I dotted Dazzling Details on those. I also used Cherry Cobbler Dazzling Details on the snowman's hat. For this weeks current challenge its a sketch challenge. I'm not big fan of square cards since most of my cards get mailed to the lower 48, so I switched to a regular A2 size but other than that the sketch is all intact! I love what you did with last weeks color challenge as well as this weeks sketch challenge. Hope this week goes a little better for you. Thanks for playing along with us at Merry Monday. Aw, so sorry about your cat....we lost ours of 18 years last fall. It leaves a big whole in your home for sure. Your snow card is adorable...love the background! And your card for this week uses one of my favorite silhouette images ever! Thanks for playing and keeping current! So sorry to hear about your cat, Lisa. We lost our dog last year and it's very devastating, so I know how all that feels. Anyways, both your cards are so pretty! Love this week's card for the color combo and that amazing image! I almost used the same one! Fabulous job! Sorry to hear about your beloved cat passing. Pets are part of the family and are missed greatly. You were so lucky to have 16 years of memories with Nimitz. I love both of your cards! The Let it Snow card is so fun and the second card has a vintage feel from the stamped image. Hope you have a much better week. I missed you last week, Lisa. I'm so sorry it was such a bad week for you. Hopefully it makes this week look that much better! I love that first card. It's another set I should have bought and didn't. This weeks card is just as awesome! Beautiful selection of paper and embossing to go with the wonderful silhouette! Thanks for sharing them with us at Merry Monday! 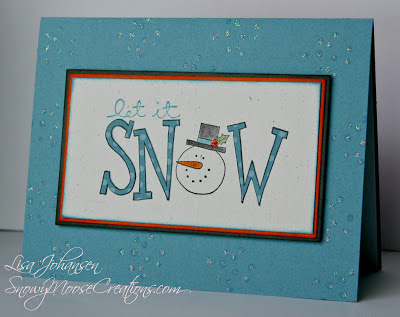 Love the inking round the framelit on your card for challenge #49- and that DSP is wonderful! 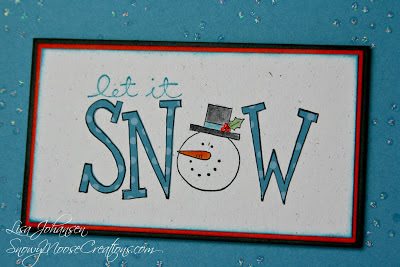 Both cards are fabulous Lisa, you rocked the colour challenge and I love wonderful scene on this weeks card. The papers are fantastic. Thank you for joining us for Merry Monday this week. 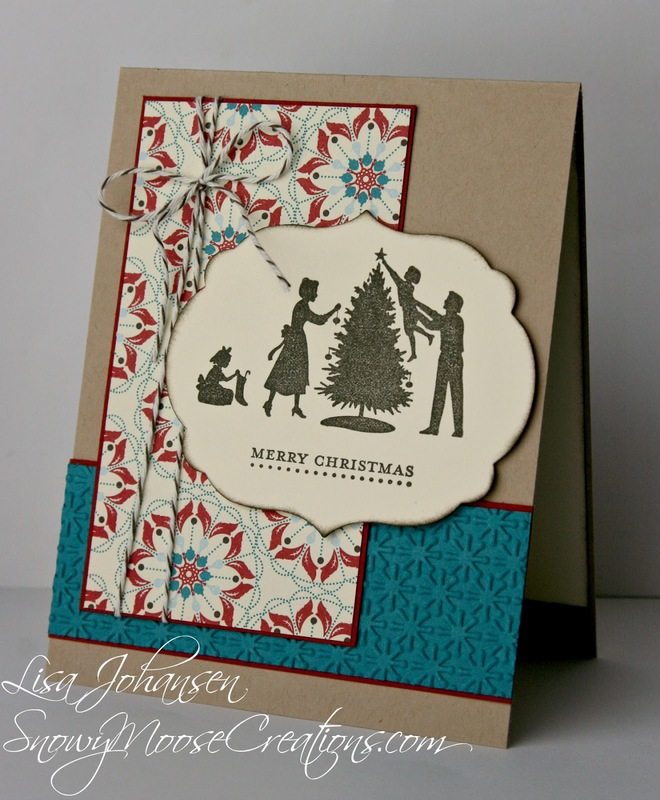 Love your cards Lisa, great combination of colors. Your cards are fabulous, Lisa. I love the colour combo you have used for the sketch challenge and its clean look. Thanks for playing at Merry Monday this week. Both cards are so pretty! I am very sorry for the loss of your furbaby! I'm glad you've been able to keep up with the challenges Lisa and sad to hear about your cat. Both cards are just beautiful - I especially love the colours of your second card! Thanks for joining us at Merry Monday this week! You go girl! Love the way you used the colours from last week! Genius! Lovely card this week, I like the silhouette stamp! Thank you for joining us at Merry Monday!